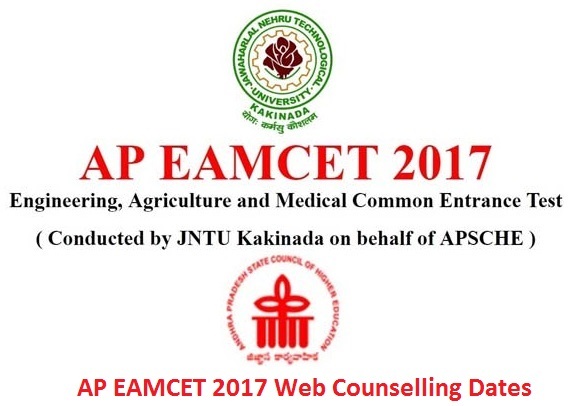 AP EAMCET Counselling 2017 Date: The Andhra Pradesh Engineering, Agriculture, and Medical Common Entrance Test (AP EAMCET 2017) Counselling will begin from 8 June.According to Jawaharlal Nehru Technological University (JNTU), Kakinada, which conducted the AP EAMCET, students who have qualified AP EAMCET 2017 have to appear for certificate verification in the counseling rounds.The JNTU has issued a list of Help Line Centers where students can go for the verification as per a schedule decided on the basis of their ranks. The Candidates can appear for the AP EAMCET 2017 Counselling only after paying the registration fees. While general and OBC category students have to pay Rs.1200, the fee for ST/SC students is Rs. 600. Candidates are required to carry their original certificates along with two photocopies of all the documents. The reporting time for all candidates is 9 a.m. Following certificate verification, students can select the courses and universities through choice filling. They would also have the option to change their options from 21 to 22 June. AP EAMCET is a common entrance test for entry into undergraduate engineering and medicine Programmes. It was conducted 24 to 27 April and the result was declared on 5 May. RANK WISE SCHEDULE FOR OPTION ENTRY. The admission process will be the last stage of each exam. After the successful completion of the counselling, The candidates have to report at the allotted college. Candidates must carry the allotment letter & all the original documents for verification & admission. In case, the candidate will not report at the allotted college in a given time period, the seat will be given to another candidate.